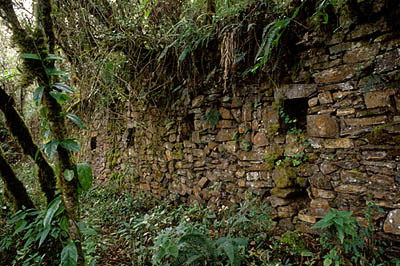 Recently uncovered residences, behind the Ushnu hill, Choquequirao. Subject: Re: INKA'S EMPIRE TOURS: BIENVENIDOS! It WAS wonderful. I want to send you a thoughtful, detailed account of our experience. Give me a couple of days to gather my thoughts. But, know that it was truly unforgettable. I have already given your name to two friends who will be contacting you. 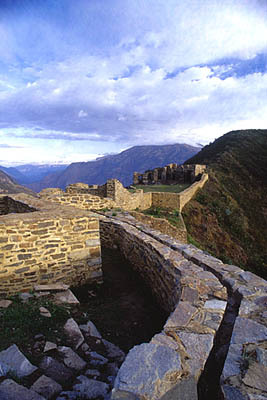 Entry to the Ushnu hill, view from the canal of the Urin sector, Choquequirao. Sol y Luna wasn't TERRIBLE, just not nearly the calibre of Monasterio or Country Club. The service was not attentive at all, accommodations below average, food just average and, as we were leaving, we realized we left our water bottles in the room. We asked to be let back in our room to get them; the woman at the desk said there were water bottles in the restaurant. We went OURSELVES to get three, and then were charged 19.50 soles. Not gracious. Since I've started this download, Ill just keep going. Well, everything was perfect. Our two drivers Miguel in Lima and Juan Carlos in Cusco were AMAZING. Loved them. Beautifully dressed, well groomed, smiling, courteous, unflappable despite some challenging situations, Our two guides were fabulous Nelida and Edison. Our representative, Maria, in Cusco was extremely attentive, sweet and accommodating. Our rep in Lima, Victor Hugo, was just average. Not as attentive as the others. Not overly helpful when our bags did not make it to Lima with us. Anyway, no major complaints about him, just paled by comparison to the others. The only uncomfortable moment came our last night on the trek. Edison, our guide, took Michael and me aside and said that he didnt know what you had instructed us to give as tips, but whatever it was, he was sure it was too little. When we asked what he thought was appropriate he said: 100 soles per porter, 200 soles each for the chief porter and cook. We followed his direction as we had no way to contact you or our Cusco rep, but it was definitely a bit awkward. Your thoughts on this? As for the restaurants ALL were amazing. Loved Huaca Pullcana, MAP, Astrid y Gaston and Monasterio. Also, it was evident to me (only because I am highly intuitive, not because she said anything) that Nelida, our guide in Lima, negotiated with the home office to cover the cost of our entire lunch at Astrid y Gaston. I know we must have gone over budget given all that we ordered. But she VERY discreetly chatted with the office and, I believe, convinced them to cover the whole bill because we had pared down our itinerary that day significantly. THAT is the kind of service that was SO noticeable and welcomed on this trip. Call me if you want to talk live about any of this. I am getting on a conf call right now for about 20 mins, but am available all day. Home or cell. Thanks SO much. We will DEFINITELY travel with you again. 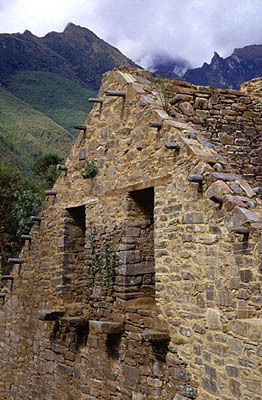 Residence of the Urin sector with its stone "poles" to fasten the roof, Choquequirao. First of all, your offer to reimburse us for the tips is above and beyond gracious. We will decline that lovely offer. Let's just say you'll apply that credit to a future journey, okay? As for the 90 minute delay, I was referring to the morning we left Sol y Luna, headed toward Cachora. Edison said that we would have been 90 minutes closer to Cachora had we stayed in Cusco one more night. As for us, we would have LOVED one more night at the Hotel Monasterio, for several reasons. First of all, its spectacular. Secondly, it would have given us an extra night not having to pack and unpack everything. Thirdly, there is so much to Cusco that we did not see. We will DEFINITELY return to Cusco sometime in the future. Please let me know if there is anything else on which I can offer insight. We'd also love to be a reference for you and Inka's Empire Tours. PS made causa last night with shrimp and avocado, my first time. My family LOVED it! One more disappointment: Gaston Acurio's cookbooks are only available in Spanish! 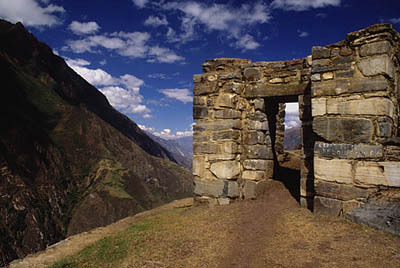 Entrance doorway of the "Triumphal Wall", Choquequirao. You read my mind!!! We didn't adore the Country Club Lima, but it was fine. A little musty, to be sure, and the room décor a bit tired. Once we experienced the Monasterio and I learned that they also ran Miraflores Park, I had Miguel drive us by there on our last day in Lima. I would definitely give that a try. If I ever were to return to Lima, I would not stay at Country Club again. As I said, there were no issues at all, it just didn't sparkle like Orient-Express hotels do. VSOE service is unparalleled, professional and so deferential. Have you seen the rooms at Miraflores Park? The hotel seems to be in a more hip neighborhood than San Isidro. I loved the neighborhood around Astrid y Gaston. So wished we had more time to explore there. At the risk of repeating myself, do not take ANY of these criticisms as complaints about our journey. It was perfection, perfection, perfection and will live on in our family's memory as one of the very best trips ever. I am only providing this feedback so you can make the right executive decisions for your future clients, just as I know you are doing. I think all your instincts are spot on. Finally, I know enough Spanish to be dangerous, though not enough to cook by. Time to take mi espanol to the next level. Please don't hesitate to ask any more questions or use us as a sounding board for new ideas. It's our pleasure. 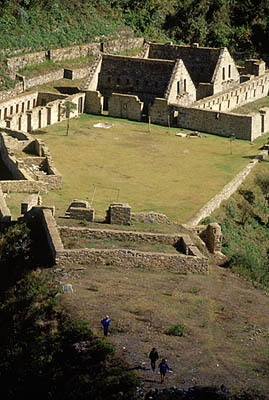 Main plaza of the Urin sector, Choquequirao. Subject: Re: INKA'S: CHOQUEQUIRAO TREK? Oh my gosh!!! That defies description! The trek was definitely challenging; far more strenuous than we had imagined, but we rose to the challenge and were unbelievably pleased with ourselves for making it through every day and even arriving earlier than our guide thought we would. Edison said we surprised him that we pushed ourselves as much as we did. Our kids had NO problems, though they said it was tough, too. The days were happily exhausting; the scenery was beyond imagination; the food and service were unbelievable; the tents, sleeping bags, equipment was top drawer. Two regrets: never saw a condor and the mosquitoes! I would definitely tell future guests to bring STRONG insect repellent and perhaps encourage them to take B6/B12 complex before visiting to try to deflect the little buggers. What else can I tell you? All the Inca sites were amazing. As you know, once we returned to Lima we felt we had had our fill of antiquities once you see the ruins in person, museum visits pale by comparison. So we opted to take a tour of modern Peru and drive through the commercial district and the colonial part of town. Nelida was an AMAZING, flexible, knowledgeable guide. She knows EVERYTHING about Peruvian history. This was the perfect counterpoint to the 5-day idyll of our trek. I will send you a couple of photos, so you can see what we look like! Please let me know what else I can provide. The trip was almost sensory overload and it just now is sinking in HOW MUCH we really saw, did, experienced. And, the most special part of the trip has to be the time our family spent together just talking, laughing, teasing, challenging one another. Our children are 17 and 19 not too many more years where just the 4 of us can be together. This was the PERFECT experience to share. I have told this to ALL my friends who have children at these ages. It is the ultimate bonding experience.